On October 25, 2016, Irene Rico was selected as FHWA’s Associate Administrator for Civil Rights. In this capacity, she leads and directs a professional staff in providing civil rights policy, program and strategic guidance to FHWA Program Offices, division offices, other Federal agencies, State departments of transportation, and private sector organizations. She also guides the development and implementation of Agency civil rights action plans to further improve stewardship and oversight of the Disadvantaged Business Enterprise (DBE), Americans with Disabilities Act, Title VI program, Contractor Compliance program, State Internal Equal Employment Opportunity and the Internal Equal Employment Opportunity program, and the Special Emphasis program. 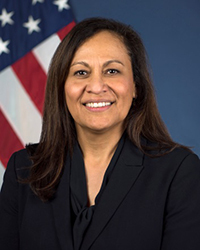 Prior to her permanent appointment, Ms. Rico served as the Acting Associate Administrator for Civil Rights beginning in September 2015. Prior to this assignment, she served for 5 years as the Division Administrator in Virginia where she oversaw the strategic management and delivery of the $900 million Federal-aid program. She has also held other key positions including Special Assistant to the Executive Director, Assistant Division Administrator in Virginia, and Director of Planning and Program Development in Texas. Ms. Rico's experience also includes serving as an Area Engineer in the FHWA New Mexico Division for more than 8 years where she oversaw the design, construction and operations of transportation projects. Ms. Rico has 34 years of experience with FHWA. She received a Bachelor of Science degree in Civil Engineering from the University of Texas at El Paso, and obtained a Master of Science degree in Civil Engineering from the University of New Mexico in Albuquerque, NM.